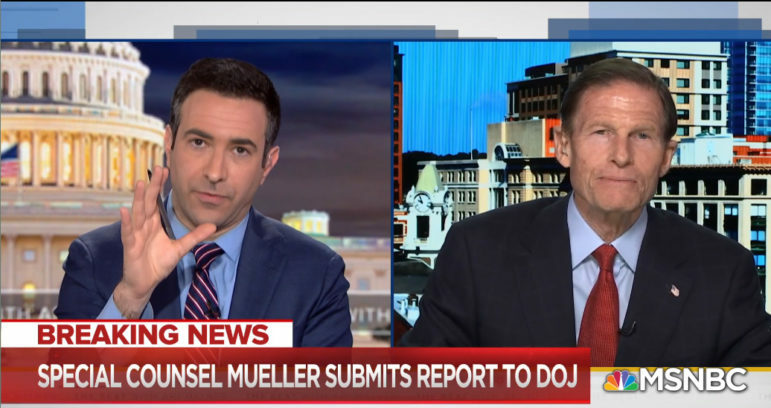 Sen. Richard Blumenthal, D-CT, appearing on MSNBC with host Ari Melber. Washington – The Trump campaign on Monday attacked the credibility of Connecticut Sen. Richard Blumenthal and several other Democrats, warning television networks against booking them on their news shows. “You should begin by asking the basic question: Does this guest warrant further appearances in our programming, given the outrageous and unsupported claims made in the past? “ Tim Murtaugh, spokesman for the Trump campaign, wrote in a memo to the television networks. Besides Blumenthal, whose name was at the top of the list, Murtaugh warned against booking Rep. Adam Schiff, D-Calif., head of the House Intelligence Committee, and Rep Jerry Nadler, D-N.Y., head of the House Judiciary Committee. Both panels are investigating the Trump campaign and the Trump administration. Also on the list is Rep. Eric Swalwell, D-Calif. — an outspoken member of House Intelligence Committee — Democratic National Committee Chairman Tom Perez and former CIA Director Tom Brennan. “The only way to interpret these conclusions is as a total and complete vindication of President Trump,” Murtaugh wrote. No one has seen the evidence that led to Mueller’s determination because the special counsel’s report has not been released in full to Congress or the public.